Easter is fast approaching so I’m buying “Bits & Bobs” ready for the Easter Egg Trail we hold each year at Nanny’s house (believe it or not we started this tradition when Danny was just weeks old. Not that he can remember any of of his first Easter but us grown ups had lots of fun)! There is never any need to buy the kids chocolate or Easter Eggs as they always end up with too many from kind friends and relatives, so Mum and I look out for useful things the kids need and can use again, for example the kids may find new Summer hats, glasses and socks at some clues on their Easter Trail. 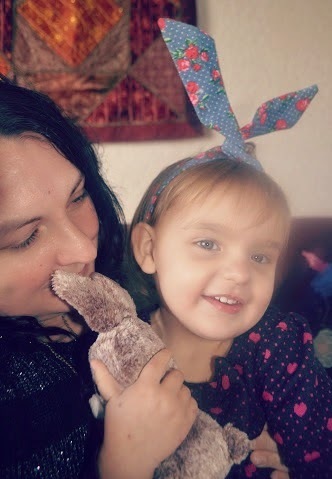 For the girls, hair accessories are always well received, so I thought these Rabbit Hair Bands would make great Easter gifts. I asked Izzy to model one before I hid them away ready for Easter. Oh, she looks so cute! They are great just as everyday hairbands (you can mould the wire and style the hairband however you like it) or even as an addition to the fancy dress box. Izzy made me have a photo with one on too (well it’s not fair just making her do all the hard work!) and I admit that I really want one now too. I can’t wait until Easter, when Rebecca, Cerys, Caitlyn and Izzy can all wear them! I also bought this Rabbit Lunch Box for Izzy as I always need more snack containers for her. It could also be used for storing craft items, such as crayons, or accessories such as hair bobbles etc. I love the vintage style illustration so much, it really takes me back to popular prints from when I was younger. I am tempted to buy the fox design too as I can never have too many storage containers. My last buy was not linked to Easter. My friend, who is an amazing photographer, mentioned that she was struggling with her paperwork. When I spotted this Camera Stamp I thought that it might cheer her up, so I popped one into my online trolley and I may have also added an extra one for me! I’ve always been a fan of stamps (I think it must be the teacher side of me!). I’m using this stamper to mark off when I have taken photos for review blog posts and tutorials etc. Therefore, this stamper fits with my ethos of only buying things that are both beautiful and practical. I now want a few other stampers to help with my blogging organisation… a vintage typewriter stamp to mark off when posts have been typed up, a vintage sewing machine stamp to show when I have completed craft tasks and a Globe to stamp when I have shared my posts all over the World Wide Web! If you’re looking for non-chocolate gifts for Easter, then take a look at Tigerlilly Quinn as they have other cute “Rabbit” items in stock, such as a Rabbit Clock, Rabbit Sticky Notes and Rabbit Notebook. Love Fritha's shop 🙂 And those boxes are so cute… if I didn't have a zillion similar ones already I'd be buying more! super cute! there's so many lovely little things in her shop, isn't there? Definitely something a little different for Easter. Always a good thing. LOVE this!! 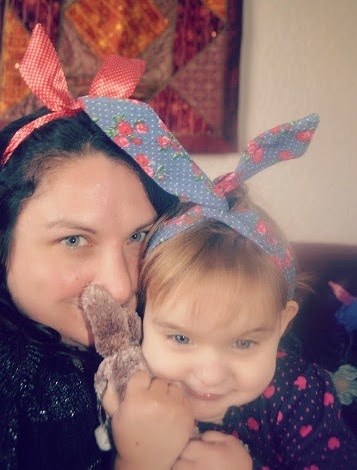 My daughter would absolutely love those hairbands – and I really want the photo stamp! We are big fans of the Tigerlilly Quinn shop too – always an amazing mix of beautiful things!